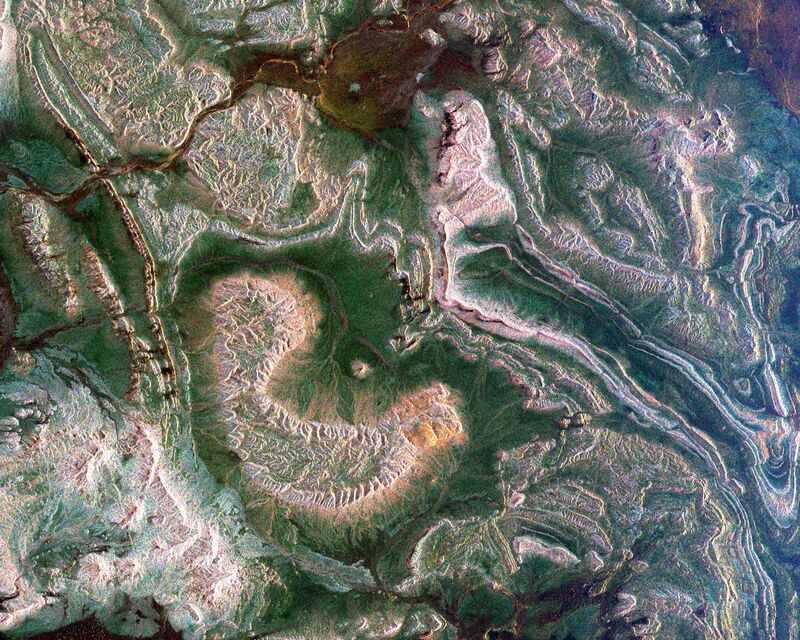 This spaceborne radar image shows how the Atlas Mountains in northwestern Africa dominate the geography of Morocco. 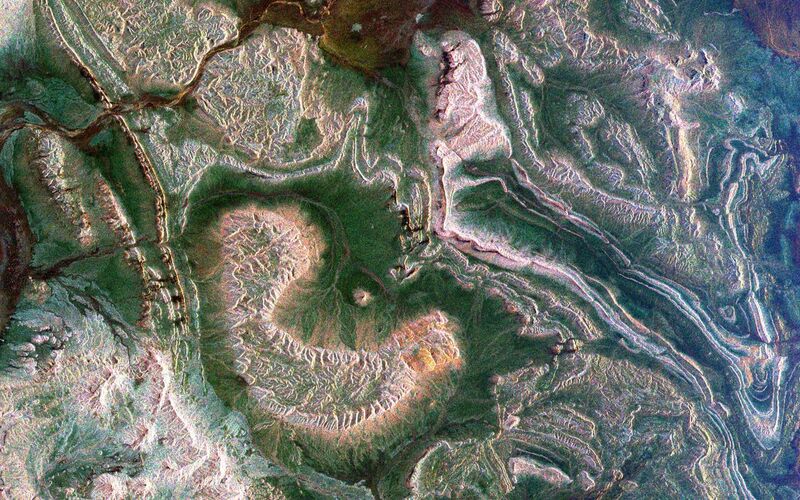 The image shows a part of the eastern flank of these mountains near the town of Rissani, approximately 50 kilometers (31 miles) from its border with Algeria. The striking bright patterns are the complex folds in the layered rocks of this region. Careful examination of the image shows areas where the folded structures have been disrupted due to fault movement and earthquakes. Dark areas between the rock outcrops are covered in sand and serve as channels for seasonal streams in this arid region. 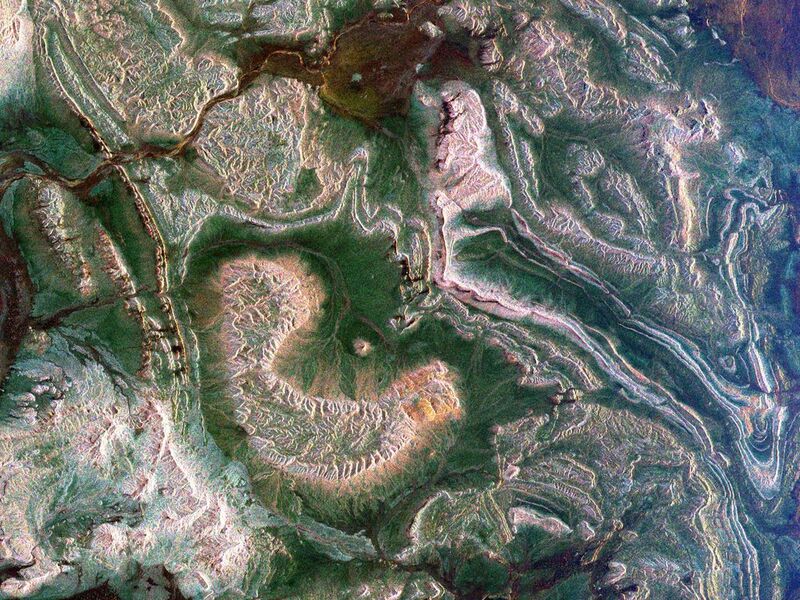 Scientists can use images like this one to map the geology and drainage patterns in arid regions. The area shown is 44 kilometers by 34 kilometers (27 miles by 21 miles) centered at 31 degrees north latitude, 4.4 degrees west longitude; north is toward the upper right. Colors are assigned to different radar frequencies and polarizations as follows: red is L-band horizontally transmitted, horizontally received; green is C-band horizontally transmitted, horizontally received; blue is C-band horizontally transmitted, vertically received. The image was acquired by the Spaceborne Imaging Radar-C/X-band Synthetic Aperture (SIR-C/X-SAR) imaging radar when it flew aboard the space shuttle Endeavour on April 15, 1994. SIR-C/X-SAR, a joint mission of the German, Italian and United States space agencies, is part of NASA's Mission to Planet Earth program.